The title of this article is ambiguous. This article is about the American Transformers game by Activision. Other games see Transformers.. 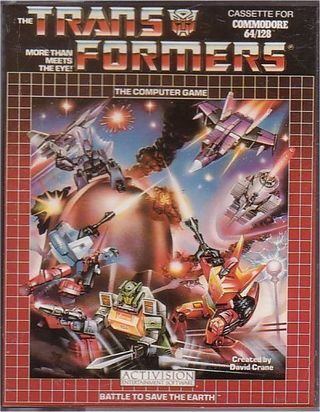 The player controls these eight Autobots in the game: Cliffjumper, Hound, Pipes, Kup, Bumblebee, Blurr and Rodimus Prime/Hot Rod. In Transformers players choose the Autobot to go to locations on the map. When they reach the location the game switches to a first-person view, and players have to move a cross hair to shoot at a near-endless stream of Decepticon jets that fly onto the screen. 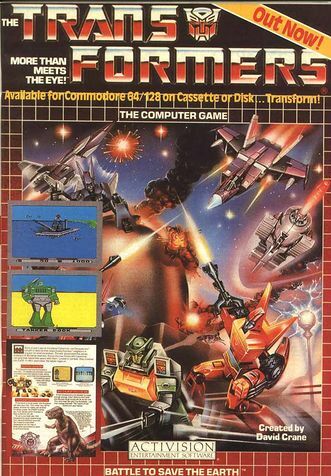 Players can be hit by their missiles - too many hits and the screen cracks up and the Autobot is defeated, requiring another one to take it's place. The more Decepticon jets that are destroyed, the longer it takes for the Decepticons to progress to the next stage of the plan, in sequence. The game's intro features over a minute of speech which is notable both in 1984 and for the Commodore 64 platform itself. There are no known cheats for this game. Apparently, there are no cracked versions with inculded trainers. Julian Rignall in Zzap!64 issue April 1987: "Everything about this program is rubbish. For a start, the plot is so awful that it wouldn't convince a three-year-old. Next come the graphics, and these are in the same league as the plot, as they would disappoint the same unfortunate child. Actually, they look as though they've been drawn by someone of that age. Obviously concepts such as perspective, shading, 3D and colour were all a little too much for the artist to cope with. The sound is an out-and-out joke, and it all gets boring after a couple of plays. How the programmers could pass this off as a professional product is beyond me entirely. Don't buy this — not even if you think the toys are the best thing since sliced bread." Richard Eddy in Zzap!64 issue April 1987: "If there's anything I hate the most about games it's waiting for minutes on end for something to happen. This happens recurringly with Transformers, especially on the map screen where the action only happens once every two or three minutes. Then, when you consider the effort it takes to reach any of the destinations, on arriving the Decepticons fly around as such as speed that is quite impossible to hit them with the slow firing laser that is provided. The graphics are of a similar standard to the sound — poor and irritating, and no matter how long I played it I felt I was making no headway. Generally, Transformers is annoyingly dull and I advise you not to waste either effort or money on it." Paul Sumner in Zzap!64 issue April 1987: "There's an impressive credits list on the inlay, and given the talents involved it's surprising that the end product isn't up to much. The sound and graphics are mediocre, and the gameplay falls between the two stools of strategy and arcade action. The pace varies from slow on the map screen to cumbersome in the arcade sections. If you want an excellent toy tie-in, go for Zoids. Transformers isn't very pretty, nor is it very compelling." Shmendric: "Sure, you can buy this weird game as a voice output demo. But otherwise you can not do a lot with it - you can put the disc on your "to-be-formatted" pile, and in the box you can keep screws or something..."
Transformers (Japanese: トランスフォーマー Hepburn: Toransufōmā) is a Japanese–American media franchise, produced by Japanese toy company Takara Tomy and American toy company Hasbro. Initially a line of transforming mecha toys rebranded from Takara's Diaclone and Microman toylines, the franchise began in 1984 with the Transformers toy line, and centers on factions of self-configuring modular extraterrestrial robotic lifeforms (often the Autobots and the Decepticons) in an endless civil war for dominance or eventual peace. In its history, the Transformers robot superhero franchise has expanded to encompass comic books, animation, video games and films. The game was released in two versions; floppy disk and cassette. 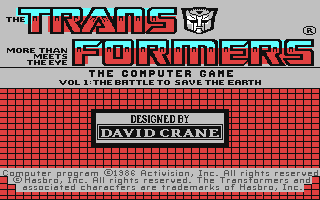 The floppy disk version features an introductory sequence describing the back story of the Transformers with sampled speech narration and loads the "transformation" animations from disk in game. 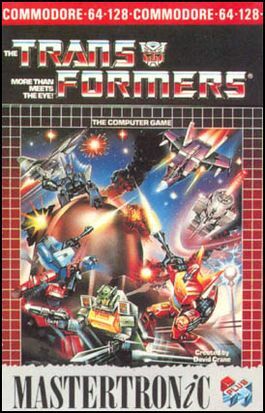 The cassette version however omits the introductory sequence and gives the player the option to choose which of the Transformer characters' animations should be shown during gameplay - the transformation sequence for this character alone will be shown and all other characters' map screen icons merely change colour to indicate robot or vehicle mode. The cassette version also crashes when the player reaches a certain point in the game (the "Pipeline Junction") meaning that the game is not completable on this format. This page was last modified on 6 April 2019, at 01:05.